Trying To Locate a Superior Painting Contractor in Harrison, TN? You’ll always get what you’re looking for and so much more when you hire a Harrison painting contractor. Besides the roadside scenery and small city life, Harrison is know to have a good painting contractor or two. Call Williams Painting Company and you’ll see just how much change will go into your home from our services. A painting contractor is not just a painting contractor these days. In order to get more business and get our name out there, Williams Painting Company does a lot in the way of Chattanooga home improvements. We do staining and wallpaper removal as well. You might want to get your home more modernized by allowing us to remove your wallpaper. Wallpaper is old-fashioned and we can eliminate off your walls. Using a safe solution, we’re the painting contractors that will make your walls a little more modernized. Staining is another one of the services that we offer. If you want to preserve your deck, then staining will do the trick. Bring out the beauty of your wooden deck and you’ll be the popular party spot this summer. There is no reason why you shouldn’t hire a Harrison interior painting contractor to do the panting in your home. 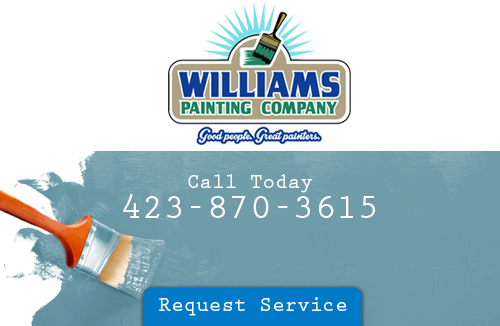 Painting a home take a skilled hand and that’s exactly what you’ll get when you have Williams Painting Company. House painters always use a higher quality paint. A house painter’s job is to paint your home to your specifications. Professional house painters always offer a warranty on their services. Good house painters use professional equipment. Hire your house painters today and you’ll be proud to say that they came from Williams Painting Company. For over 25 years, we have been bringing back smiles in the community. If you want to smile at your home again, then call us. Dirty homes never get the attention they deserve. Give it a quality power washing. Use a professional contractor to pressure wash your home off. We don’t just hose the dirt off, we keep it off so that it stays off for good. Pressure washing your home rids it of mildew and mold. You don’t want to have to deal with grime on your home and that’s why we’re here to help. Your home should be your castle and we want to keep it safe and free of such bacterial growths. Your Harrison pressure washing contractor can easily be found at Williams Painting Company. We know just how much it hurts to look at a home that’s in need of a good pressure washing. Don’t wait, nice weather is abound and so will outdoor activities. Thanks so much…the place looks great and the guys were very good to me. I will give you a call when I want to do the deck! If you are looking for a Harrison painter, please call 423-870-3615 or complete our online request form.